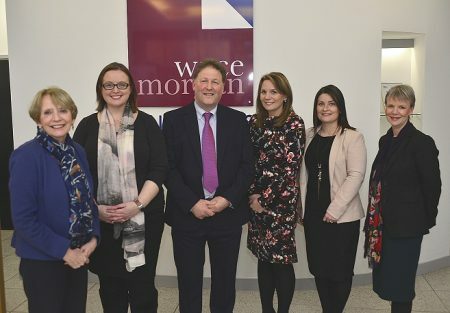 Five members of staff have been promoted at Wace Morgan Solicitors, which has its head office in Shrewsbury and another office in Newtown, Powys. Karen Ashton, who qualified as a Licenced Conveyancer in 2001 and joined Wace Morgan nine years ago, becomes an Associate. She carries out all aspects of residential property work, including sales and purchases, re-mortgages, registration of property at the Land Registry, transfers of equity and boundary and adverse possession queries. Rachel Wierzbinski, who has been with the firm for four years as a Solicitor and has a range of commercial clients, including developers and private and commercial property investors, is also promoted to Associate. She regularly deals with commercial property leases, sales and purchases of continuing businesses as well as commercial and agricultural property issues, whether funded privately or with the benefit of lender funding and pension funds. Zoe Detheridge joined the commercial team at Wace Morgan three years ago and now becomes a Partner at the firm. She qualified as a Solicitor in 2008 with a top tier Birmingham firm where she gained a vast amount of experience working alongside large commercial developers, private and commercial investors, commercial lenders and pension schemes. She now works for both developers and landowners on transactions involving mostly residential development but also has experience in dealing with landlord and tenant matters. Andrew Oxenham started with Wace Morgan in 2013 as a Solicitor and now moves up to the position of Partner. Having previously worked in Shropshire and London, he is a registered Trust and Estates Practitioner and is also a member of the Law Society and Solicitors For The Elderly and on the Board of Trustees of Oriel Davies Gallery in Newtown. His specialist knowledge is in the administration of deceased’s estates and affairs of disabled people and he also specialises in the preparation and administration of trusts, inheritance tax planning, wills and powers of attorney, Court of Protection deputyship cases and associated tax issues. Claire Jenkins, also made a Partner, qualified as a Solicitor in 2010 and initially carried out work in a broad range of areas. However, she has since specialised in property work, dealing in both residential and commercial sectors acting for clients all over the country. Diana Packwood, Managing Director of Wace Morgan, said that she was pleased to see members of her team progressing through the ranks. “As we grow and evolve as a business I am delighted to see colleagues promoted to positions of responsibility – they will help to guide and inspire Wace Morgan as the business expands even further,” she said.